Not only has Dr R K Pachauri, chairman of the UN's IPCC been developing a very significant portfolio of private interests, evidence is mounting that he has been carrying out his business activities for these organisations under the guise of his UN duties, and charging the expenses to the UN. This has emerged in part from an official document published by the IPCC Secretariat late August 2008 in response to public questions about Pachauri's "carbon footprint" arising from his globe-trotting activities. Under the title "Outreach activities carried out by the IPCC Chairman", covering his itinerary for January 2007 to July 2008, the main purpose was to reassure the public that, while engaged on UN activities he had indeed flown many miles, in each case the UN had paid "carbon offsets" for the flights – details of which were listed against each "official" engagement. However, unwittingly, this document has revealed more than either the UN – and certainly Dr Pachauri – had intended. It provides effective proof that, on more than one occasion Pachauri was indeed using UN funding for his own commercial interests. One egregious example of this comes on 7 July 2008, when – in amongst his 443,243 miles flown in the 19-month period - Dr Pachauri is recorded by the UN as having travelled 1,432 miles from Abu Dhabi, where he was attending the Zayed Future Energy Prize Award, to visit Delhi for what is officially described as "Visit of Basque delegation to TERI". There, he meets José Antonio -Tontxu- Campos Granados, Minister Of Education, Universities And Research and Esther Larrañaga Galdos, Minister Of Environment And Land Use Planning, both from the Basque Government. No other business is recorded that day, or at all until 14 July when, at the UN's expense, he flies 3,446 miles to Vienna for a UN ceremony. However, while the UN records this as official business, the Basque delegation is perhaps unaware of this. On one of its own official websites, it records that the delegation visited the TERI offices to meet its Director General, Dr RK Pachauri, in order to sign a collaboration agreement between TERI and their own research institute, the Basque Institute Centre on Climate Change (BC3) – which had only been set up the previous April. Interestingly, the research director of BC3 is Professor Anil Markandya, formerly of Bath University and lead author for Working Group III (on mitigation of climate impacts) in the IPCC 4th Assessment and a contributing author for Working Group II (on identifying the impacts of climate change). Markandya was, therefore, working with Pachauri's IPCC on the report which gained his boss a share in the Nobel Prize. Whether a fee was paid by the Basques to TERI is not clear, but the deal is agreed for three years, amounting to adding to BC3 staff, from September, a series of "top-level international experts" from TERI, while a number of Masters students are sent to India. There, we find that they are to partake in a new Masters programme "to train students in sustainable development", taught at the TERI University based in Delhi. The programme is to be funded to the tune of $900,000 by the Chicago-based John D and Catherine T MacArthur Foundation which, as we reported, also sponsors Pachauri's TERI North America operation in Washington. Another "partner" to the programme is, incidentally, the University of East Anglia, home of the Climatic Research Unit (CRU) of Climategate fame. Whatever the finer details of the arrangement with the Basques might have been, however, what is amply clear is that their official visit to Delhi on 7 July to meet Pachauri in Delhi had nothing whatsoever to do with UN business – and everything to do with Pachauri's personal position as Director General of TERI. For that, at UN expense, Pachauri took a 1,432 miles from Abu Dhabi to get to Delhi and then a 3,446-mile trip to Vienna, totalling 4,878 miles. The direct route from Abu Dhabi to Vienna is 2,637 miles, with Pachauri's private business adding over 2,000 miles to his journey. Whether there would have been other arrangements in place for Pachauri to have returned home to India in the week that elapsed between 7 and 14 July when he was due in Vienna, we cannot tell. 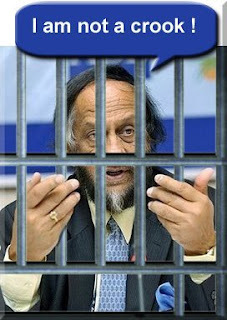 But the fact is that Pachauri's official place of work as chairman of the IPCC is Geneva, where its offices are based. He had no reason to go to Delhi other than on private business, yet he was falsely recorded as representing the UN. In most jurisdictions, this kind of deception is regarded as theft and most employers treat gross misuse of expenses as a sackable offence. For the gifted and so far untouchable Dr Pachauri, however, this seems to be just another perk of the job.